I tried so hard to be a good genea-boy this year. I worked hard speaking all over Southern California and teaching at OASIS, serving my local societies, editing and writing my society newsletter and over 900 blog posts, participating in some Google+ Hangouts On Air, attending two genealogy conferences and a genealogy cruise, and helping several friends and colleagues with their research. In addition, I have added more names, facts, media and (especially) sources to my database. Thank you for last year's gifts - an iPhone 5s with lots of gigs, some nifty apps, a great camera, and iCloud, which works really well transferring photos to my computer. That was really good stuff...but you didn't bring me the other things I asked for. Was I a bad genea-boy, or maybe you thought I had enough, or you were out of the other things. I'll ask for them again! * Some genealogy books to read, both in print and in PDF. I especially want the NGS book Genealogy and the Law. * A genea-robot that can work 24 hours a day on getting my genea-piles organized - that is so boring and there is so much to do ... but a robot would not have to sleep or eat or spend time with my wife (I promise!). Maybe I could even train it to write blog posts. Or enter Find A Grave and census source citations. Or search Ancestry and FamilySearch for ancestral records. * A solid lead on the ancestry of William Knapp (1775-1856), Thomas J. Newton (ca 1800-ca 1840), Devier James Lamphear Smith (1839-1894) and Hannah Smith (1768-1827) would be welcome too! Thank you, Genea-Santa, for listening to my pleas. I will leave a nice personal meat-lovers pizza in the freezer for you (you can heat it in the kitchen microwave), a rosy red apple and some delicious chocolate chip cookies on the fireplace hearth, and some eggnog (in the refrigerator) for you on Christmas Eve just in case you need fortification. You can get a yummy Dove chocolate ice cream bar out of the refrigerator if you'd like. Nothing's too good for Genea-Santa - mi casa es su casa! I am in the 8th great-grandmothers and I'm up to Ancestor #1069 who is Abigail BACON (!667-1743) [Note: the earlier great-grandmothers and 8th great-grandfathers have been covered in earlier posts]. 1068. Josiah Wood, born 10 October 1658 in Charlestown, Suffolk, Massachusetts, United States; died 09 March 1741 in Woburn, Middlesex, Massachusetts, United States. He was the son of 2136. Josiah Wood and 2137. Lydia Bacon. He married 13 December 1686 in Woburn, Middlesex, Massachusetts, United States. 1069. Abigail Bacon, born 05 March 1667 in Woburn, Middlesex, Massachusetts, United States; died 06 December 1743 in Woburn, Middlesex, Massachusetts, United States. * Abigail Wood (1691-1739), married 1723 Benjamin Simonds (1681-1750). * Samuel Wood (1693-1745), married 1716 Elizabeth Wright (1694-1747). 2138. Michael Bacon, born before 16 February 1639 in Winston, Suffolk, England; died 13 August 1701 in Billerica, Middlesex, Massachusetts, United States. He married 22 March 1660 in Woburn, Middlesex, Massachusetts, United States. 2139. Sarah Richardson, born before 22 November 1640 in Woburn, Middlesex, Massachusetts, United States; died 15 August 1694 in Billerica, Middlesex, Massachusetts, United States. She was the daughter of 4278. Thomas Richardson and 4279. Mary Baldwin. * Jonathan Bacon (1672-1754), married (1) 1694 Elizabeth Giles (1671-1738); (2) 1719 Elizabeth Hancock (1685-1748). * Josiah Bacon (1678-1723), married 1702 Mary (1678-????). 4276. Michael Bacon, born about 1608 in Winston, Suffolk, England; died 04 July 1688 in Woburn, Middlesex, Massachusetts, United States. He married 31 August 1634 in Winston, Suffolk, England. 4277. Mary, born about 1607 in probably Winston, Suffolk, England; died 26 August 1655 in Woburn, Middlesex, Massachusetts, United States. 8552. Michael Bacon, born before 06 December 1579 in Winston, Suffolk, England; died 18 April 1648 in Dedham, Norfolk, Massachusetts, United States. He was the son of 17104. Michael Bacon and 17105. Elizabeth. He married 20 September 1607 in Dedham, Essex, England. 8553. Alice, born in England; died 02 April 1648 in Dedham, Norfolk, Massachusetts, United States. * Michael Bacon (1608-1688), married (1) 1634 Mary (1607-1655); (2) 1655 Mary Baldwin (1612-1670); (3) 1670 Mary Haynes (1620-????). * John Bacon (1626-1683), married 1651 Rebecca Hall (????-1694). * Sarah Bacon (1628-1652), married 1648 Anthony Hubbard. * Leon Brooks Bacon, "Michael Bacon and his Descendants," New England Historical and Genealogical Register, Volume 52, number 4 (October, 1902). * Thomas W. Baldwin, Bacon Genealogy; Michael Bacon of Dedham, 1640, and his Descendants (Cambridge, Mass. : Murray and Emery Company Press, 1915). The following databases were added or updated on Ancestry.com during the period from 6 December to 12 December 2014 (all indexed databases). The complete Ancestry.com Card Catalog is at http://search.ancestry.com/search/CardCatalog.aspx. There are 32,520 databases available as of 12 December, an increase of 6 over last week. [How can that be? They have four ADDED items on the list above since 12/6/2014. ARLINGTON, VA; DECEMBER 9, 2014 –From descendants of the infamous pirate Blackbeard to heroes of the Holocaust, PBS’ GENEALOGY ROADSHOW uncovers family secrets in the series’ second season, which premieres Tuesday, January 13, 2015, at 8:00 p.m. ET/PT and airs every Tuesday through February 24 (check local listings). Part detective story, part emotional journey, GENEALOGY ROADSHOW combines history and science to uncover fascinating stories of diverse Americans in and around St. Louis, Philadelphia and New Orleans. Each individual’s story links to a larger community (and in some cases, national) history, to become part of America’s rich cultural tapestry. GENEALOGY ROADSHOW stars genealogists Kenyatta D. Berry, Joshua Taylor and Mary Tedesco and features participants with unique claims and storylines, including a woman seeking to find out if she is descended from the infamous pirate Blackbeard; a pair of sisters exploring connections to a survivor of the legendary Donner party; a man hoping to recover essential family history that washed away in Hurricane Katrina; and a man learns that the event that drove his family to the City of Brotherly Love changed the course of history. Over the course of the series, Berry, Taylor and Tedesco work with participants’ anecdotal clues, documents and family heirlooms to unite them with histories and people they never knew existed, as well as to reveal surprising turns and incredible histories. St. Louis, Philadelphia and New Orleans were chosen as representative of America’s fascinating crossroads of culture, diversity, industry and history, as well as for their deep pools of riveting stories. GENEALOGY ROADSHOW’s hosts and experts add color and context to the investigations, ensuring every artifact and every name becomes part of solving the mystery. 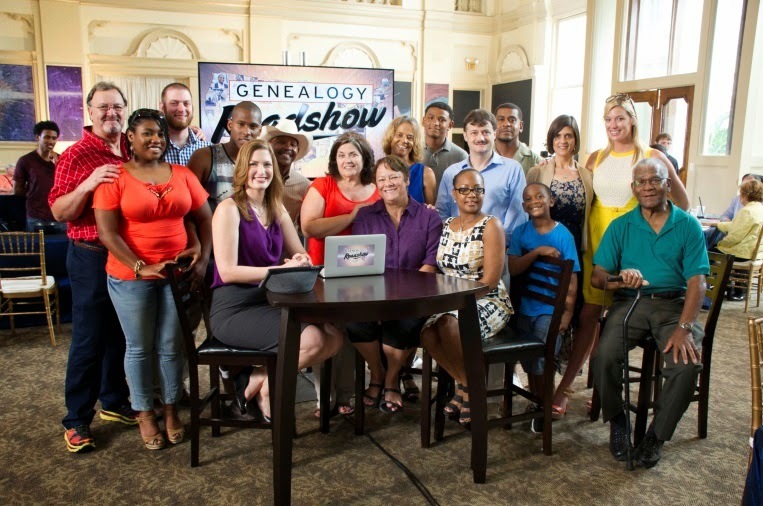 Premieres, January 13, 2015 at 8:00 p.m.
Premieres, January 20, 2015 at 8:00 p.m.
Premieres, January 27, 2015 at 8:00 p.m.
At Philadelphia’s Franklin Institute, a team of genealogists uncovers fascinating family histories. A man learns that the event that drove his family to the City of Brotherly Love changed the course of history; a man may be a Viking descendant; another’s family could have part of one of history’s biggest scams; a young man hopes to confirm his relation to a signer of the Declaration of Independence; and two sisters learn their ancestors were part of the great Irish migration. Premieres, February 3, 2015 at 8:00 p.m.
Premieres, February 10, 2015 at 8:00 p.m.
Premieres, February 17, 2015 at 8:00 p.m.
Anna (Row) Auble is #57 on my Ahnentafel list, my third great-grandmother. She married in 1804 to #56 John Auble (1780-1831). * their son, #28, David Auble (1817-1894), who married #29 Sarah Knapp (1818-1????) in 1844. Anna Row's birth date of about 1787 is an estimate. She was married in July 1804, so she would have been at least 17 years old at the time. The 1850 census record says she was 66 years old (implies 1783-1784), and the 1860 U.S. census record says she was 73 (implies 1786-1787). Her death in 1860 at age 72 would imply a birth year of about 1787-1788. "John Abel and Anna Rouw, July 15 "
The 1817 will of Philip Jacob Row identifies Anna Auble as his daughter. She received a bequest of $5. John and Anna (Row) Auble had five known children - Elizabeth, David, William, Hampton, and robert, born between 1814 and 1830. 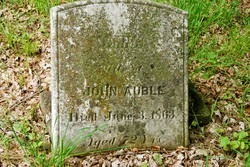 John Auble died in 1831 in Byram, Sussex County, New Jersey. * Ann L. Buit - age 5, female, white, born in N.J. The relationship between Ann Auble and Seth or Sophia Hulse is not known. There is a disparity between the death date reported in the New Jersey Deaths and burials database and the gravestone. It is possible that the gravestone was installed several years after the death and the death date was inscribed wrongly. 1. Elmer Tindall Hutchinson, Calendar of New Jersey Wills, Administrations, Etc., Volume XIII, 1814-1817 (Bayonne, N.J. : Jersey Printing Company, 1949), page 362, Philip Row abstract, 1817. 2. 1850 United States Federal Census, Sussex County, New Jersey, population schedule, Page 88B, Dwelling #247, Family #254, Seth Hulse household; indexed database and digital image, Ancestry.com (http://www.ancestry.com), citing National Archives Microfilm Publication M432, Roll 464. 3. 1860 United States Federal Census, Population Schedule, Sussex County, New Jersey, population schedule, Page 304, Dwelling #249, Family #260, Sophia Hults household; indexed database and digital image, Ancestry.com (http://www.ancestry.com), citing National Archives Microfilm Publication M653, Roll 709. 4. "New Jersey, Deaths and Burials Index, 1720-1971," online database, FamilySearch (https://familysearch.org), citing extracted death and burial records., Ann (Row) Auble entry, 1860. 5. "Sussex County Gravestones: Stillwater Methodist Churchyard," Genealogical Magazine of New Jersey, Anna Auble, wife of John S. Auble, died 3 June 1863, aged 72 years. 6. Jim Tipton, indexed database, Find A Grave (http://www.findagrave.com), Harmony Hill Methodist Church Cemetery, Stillwater, N.J., Anna Auble memorial # 13104714. 7. Norman C. Wittwer and D. A. Sinclair, "Marriage Records of the Zion Lutheran Church at Oldwick," Genealogical Magazine of New Jersey, Volume 40, page 10, John Abel and Anna Rouw entry. My Heritage released a new feature on 10 December 2014 called "Instant Discoveries." You can read a description of it on the MyHeritage Blog in Introducing Instant Discoveries. Basically, the feature permits anyone with an email address to create a new family tree on MyHeritage, by inputting their name, their parents and grandparents, and letting MyHeritage find records, and perhaps more ancestors for the grandparents, for free. There is a YouTube video of the feature being tested on the streets of New York City in https://www.youtube.com/watch?v=dQYCO1hFskU. 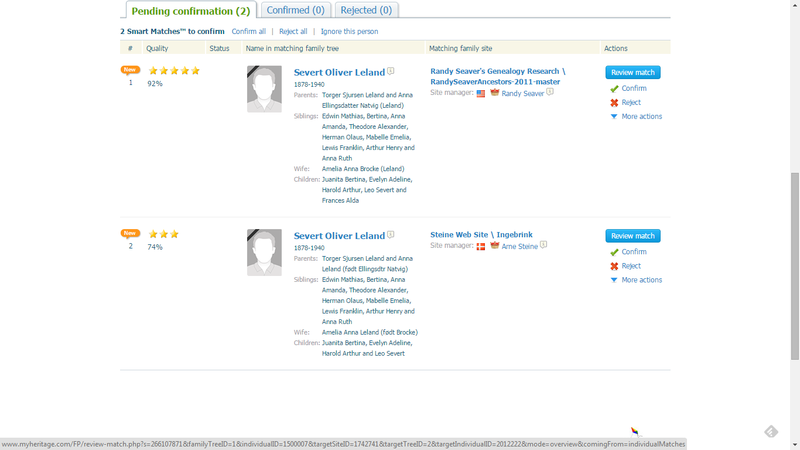 I posted about my first attempt, using a fictional person to connect into a real Seaver family, in MyHeritage Introduces Instant Discoveries Feature. In that post, I found that the "Instant discoveries" feature didn't find any ancestors of the real historical persons that I input to the MyHeritage screens. However, I determined afterwards that several of the people I entered used their middle names in records rather than the name I input to the program. I had a phone call today with MyHeritage personnel, who said my failure with the system was perhaps because I input a fictional person to start with - and I should try it with a real person as the starting point. 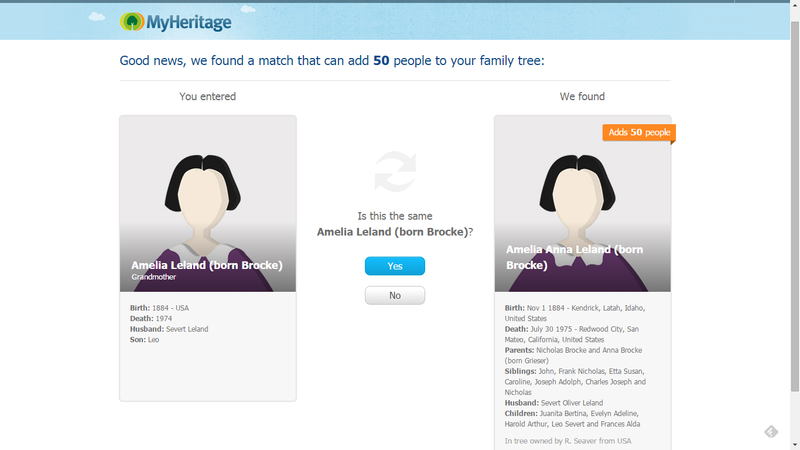 So I did that, using my wife's maiden name, and inputting her real parents and grandparents into the MyHeritage screens shown yesterday (which I won't repeat). In order to add them, I have to intentionally click on the blue "Add to my tree" button. Well, that didn't take long! 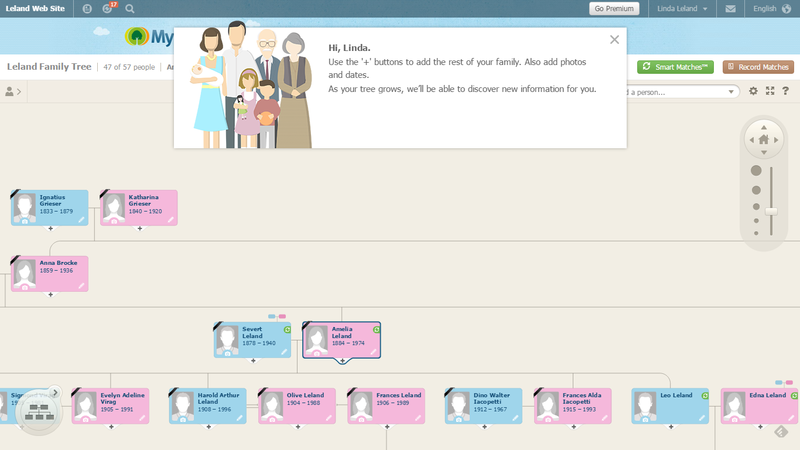 A few clicks and my wife has a new family tree of her own on MyHeritage. The message at the top says: "Use the '+' buttons to add the rest of your family. also add photos and dates. As your tree grows, we'll be able to discover new information for you." There are "+" buttons below each person on the tree, but clicking on them didn't change the screen. Where is the "+" button that I can use to "add the rest of your family"? I noticed the small blue and pink icons above Severt Leland (husband of Amelia Leland) and Edna Leland (wife of Leo Leland) and clicked those one at a time. That opened the ancestry for those two persons. 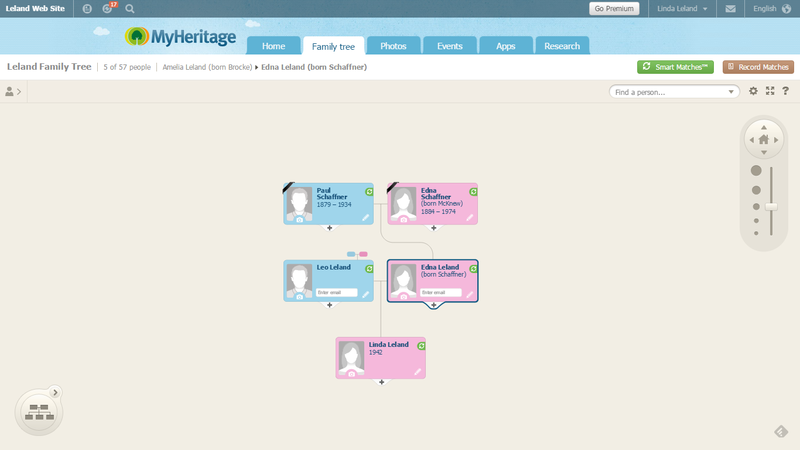 I know that I have more generations back on the Leland, Schaffner and McKnew lines in my MyHeritage tree. It didn't show me any more generations for some reason. 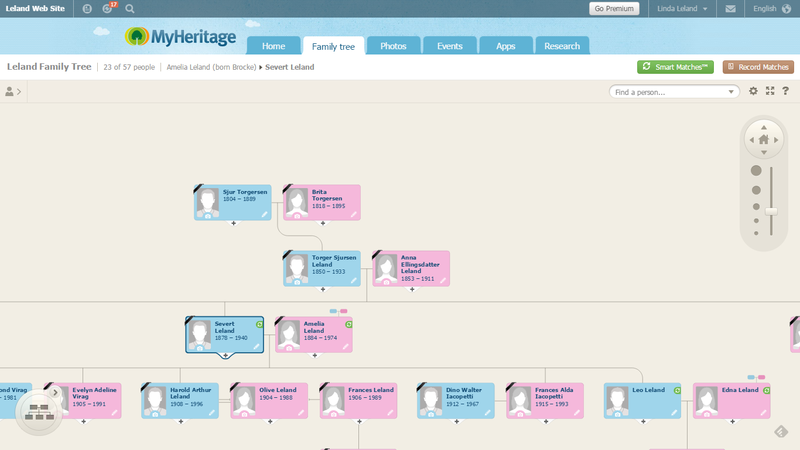 The "Instant Discoveries" system works, but I'm concerned that the system doesn't find every ancestor for the four grandparents input into the system, assuming they are available in Smart Matches (to MyHeritage trees). 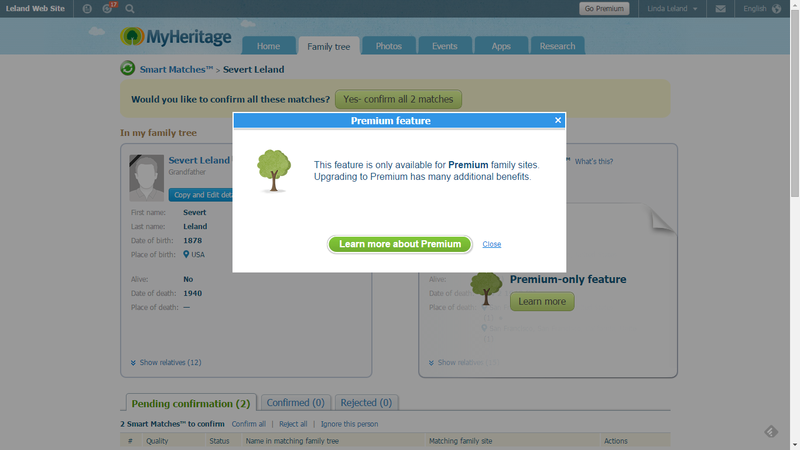 So I have to buy a "Premium" MyHeritage tree subscription to confirm the two matches. I chose not to. If I had, I could have added the "consensus" information into my tree automatically (I think). But I can click on one of the individual matches listed on the second screen above, and can see the information in the match for the person in my tree. I could copy that information down and edit the name, date, place, etc. information into my tree. I could contact the person with the tree found by the Smart Match. In a profile, I can Search the person, but it only provides a list of matches without dates and locations. To see real results, I have to subscribe to a MyHeritage data plan. When I looked at several profiles, the information in the Timeline was for the person's birth, death and marriage, and the births of their children. I think all of the information in the "Instant discoveries" comes from other MyHeritage trees - I don't see any records searched and found. So I could build a free tree (up to, what, 1,000 persons?) doing this process one person at a time. But that all relies on the research of one or more persons being accurate. My opinion is that it's better to build a family tree online or in a software program using historical records rather than other family trees. The tree data can be used for clues, but shouldn't be relied upon. My conclusion is: I don't think it matters that I put a fake name and tied them to real persons in my test yesterday. 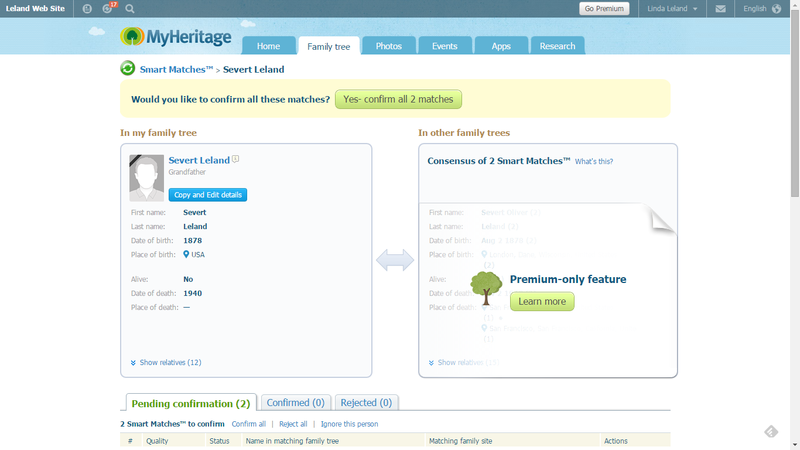 The "Instant Discoveries" system didn't find the grandparents in Smart Matches because the grandparents were not in a MyHeritage tree. In the present case, I used a real name and real parents and grandparents, and the "Instant Discoveries" system found 50 more relatives (not ancestors - they found ancestors and siblings). However, it did not find ancestors of the grandparents and siblings on the mother's line at all, even though they are in my MyHeritage tree. I watched the video noted above again, and the subjects saw photographs of their ancestors, and even a document image. 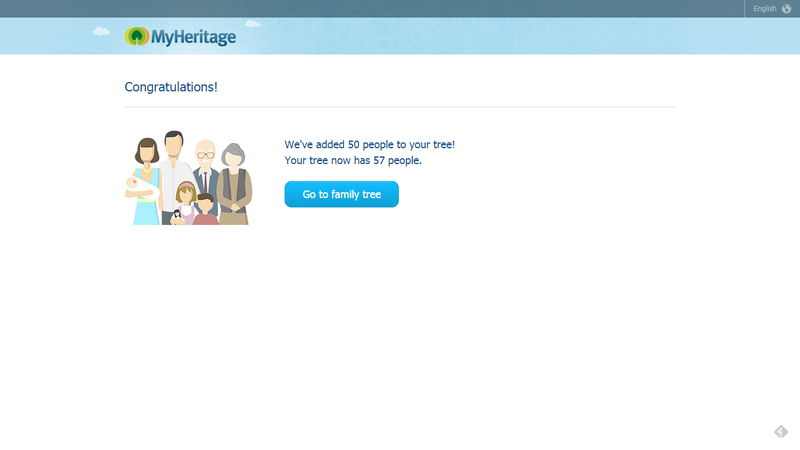 I didn't see any of that in this present study - probably because I haven't added photos of my wife's ancestors and their siblings, or any document images, to my MyHeritage tree. Now I wonder how often this "Instant Discoveries" system works? 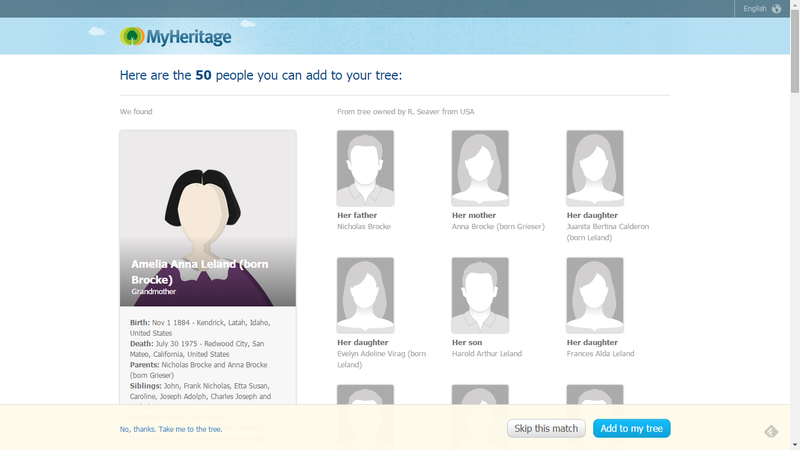 It seems to depend on the Smart Matches to the family trees of other MyHeritage subscribers. It wouldn't surprise me if the system works 30% to 50% of the time. That's great if you are one of those 30% to 50%. It's not so great if you are not - if no other researcher has entered data about your grandparents. Linda and I were on the 7-day 10th Annual TMG/Heritage Books Genealogy Cruise last week aboard the Crown Princess from Los Angeles (departing 29 November 2014) to Puerto Vallarta, Mazatlan and Cabo San Lucas, and return to Los Angeles (arriving 6 December 2014). In this post, I will focus on the genealogy-related activities. 1) The venue for all of the genealogy presentations and the one-on-ones and "Stump Craig" sessions was the "Conference Center" on Deck 6 of the Crown Princess, pretty much amidships. When we first arrived on Saturday evening, the room was split into two smaller rooms by a removable wall, which was quickly removed. The speaker's podium was in the middle of the room, with large-screen (not large enough!) television screens in each half of the room. Attendees sat at tables with three chairs each, with highly variable lighting which made it difficult to take pictures or see the syllabus material if you weren't under one of the lights. I failed to get photographs of Craig and Mark at the podium. My bad. * Angie Bush presented about DNA tests - the available tests, how to interpret the results, applying test results to the Genealogical Proof Standard, and using the results in your genealogical research. Angie presents extremely well - she is very animated and clear, with excellent graphics. * J. Mark Lowe presented about research in the South, using mortgages to construct an ancestor's life, the pre-1850 census records, and shaping a profile of a farmer ancestor. Mark is a fascinating presenter, telling stories throughout the talks with humor and folksiness. * Cyndi Ingle presented on Advanced Googling, The Hidden Web (web pages not searchable), Evernote for genealogists, and finding the silver lining in the cloud. Cyndi's presentation style is enthusiastic with lots of information. * Bill Litchman presented on the underpinnings of the Genealogical Proof Standard (highlighting mathematical, legal and genealogical proof examples), two methodological and analytical case studies, and proper research log use. He is relatively laid back and methodical in his presentations, typical of a retired chemistry professor. * Craig Scott presented researching a Revolutionary War Hessian soldier, epidemics and pandemics, A Confederate soldier case study, and using military pension ledgers, vouchers, last and final payments. Craig's presentations are forceful, providing lots of information about relatively obscure NARA records. I enjoyed all of the presentations, and have the 80 page syllabus to remind me of the details of each presentation. One of the highlights of all of the sessions was the repartee between the speakers. Craig, Mark and Cyndi have known each other for decades, and get along well. The funny and often snarky comments and questions kept everybody in stitches. 3) Each evening, either "One-on-Ones" or "Group Discussions" were scheduled in the Conference Center. I had a one-on-one with Cyndi Ingle and J. Mark Lowe about my Thomas J. Newton challenge, and they offered useful tips, including "follow the money," use timelines and maps, and consider militia and town records I had a one-on-one with Bill Litchman about my Devier James Lamphear Smith research challenge, specifically addressing using the GPS to sort out his birth date and adoption research. The "Group discussions" devolved to "Stump Craig" - asking Craig Scott about specific record types or Craig talking about his experiences with military records, especially at the National Archives. 4) Each morning at 7:30 a.m., some of the attendees met in the Horizon Court buffet for breakfast. We shared laughs, experiences, family, and genealogy over our meal. These didn't last very long because the presentations started at 8:30 a.m. on the "at sea" days, and when we were in port there were onshore tours to enjoy. 5) There was a welcome cocktail party on Saturday evening, which we were late to attend because of our fixed dining room schedule. There was also a Farewell Cocktail Party on the last night, where Craig discussed future cruise plans, thanked the speakers and attendees, and we took a group picture which I haven't seen yet. 6) Lastly, J. Mark Lowe (https://www.facebook.com/j.mark.lowe), Cyndi Ingle (https://www.facebook.com/cyndi.ingle2) and Denise Sproed (https://www.facebook.com/denisesproed) have uploaded pictures to their Facebook feed. There may be others that I have missed!